You can’t do anything about getting more rain; you can only make sure you optimise the amount of pasture production when there is moisture available, and have animals that optimise the use of the pasture that’s grown. 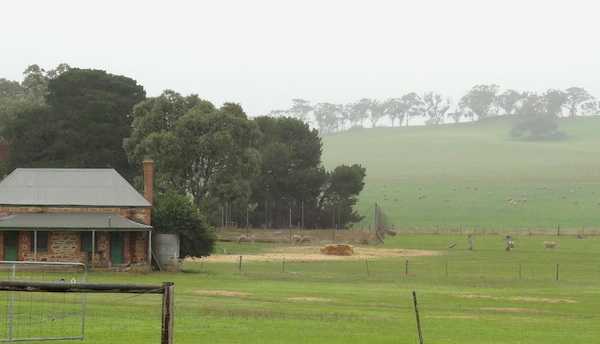 My great-great-grandfather came out here in 1839 as a 21-year-old and settled here in what was called the North Rhine area of South Australia. Sheep were the main enterprise, right from the word go. They had shepherds out in the hills – we still have the shepherds’ huts. We are 90 kilometres north-east of Adelaide, in the eastern Mount Lofty Ranges, about 15 kilometres east of the Barossa Valley. The property is 6800 hectares of mostly grazing country. We have a range of country. To the west is our high-rainfall area, where we can establish improved pastures. It’s more arable country. To the east, it’s hilly country – all native grass pastures – with an escarpment down to the Murray Plains where we have some cropping country on the western margin of the Murray-Darling Basin. The native grass pastures are very suited to broadacre sheep production, so we primarily have Merino sheep for wool – but we also have Angus cattle and some cropping. The farming business is a family partnership with my wife Sally, my brother Graham and his wife Melanie. My daughter Georgie and my nephew Alex are both coming home and taking over the business. We’ve got the 6th generation standing by, ready to go, and the 7th generation is on the way. We are in a Mediterranean climate, with about 500 mm of rainfall a year in the west, down to about 400-450 mm on the eastern edge of the property. So from west to east it drops away quite remarkably due to a pronounced rain shadow. It means we have some different environments on the property. We get mild, wet springs and hot, dry summers followed by a milder autumn and cold, wet winters. That’s historically it’s been. I don’t think there is any ‘typical’ year. It’s always been variable – but I think it’s becoming more variable. We are having more drier seasons and also some extremely wet seasons – we had the wettest season on record only a number of years ago. I think we’re getting more and more hot days too, many of which are extremely hot days. We seem to be getting more summer rainfall, perhaps due to monsoonal influences. Our winters are also tending to be warmer. When I was a child, Dad would say that one of the advantages of having that country to the west, where we get a drier climate, is that it was warmer there; we would get a lot of pasture growth there over the winter and he could fatten the wethers in July and sell them at a premium. Now that we appear to be getting warmer winters, we are getting pasture growth happening over winter over the whole property, which I don’t think we were getting historically. We are also getting tighter finishes. Our spring finishes start closing down much earlier than they historically did. We are getting more pasture growth during July-August, but once we hit spring – not always, but quite often – we haven’t got the deep subsoil moisture reserves, so we don’t get growth into the spring like we used to. This means we have to think about running the place more conservatively, and think of other ways of either growing more grass or looking at other methods of finding feed. In January 2014 we had a bushfire that was quite catastrophic. It burnt 70 per cent of our country, so we have a lot of rebuilding to do. We have been fortunate in that we have had some good early rains, so we have some green feed and the pastures are recovering quite well. But as we’ve been assessing the outlook for the year, and seeing that the Bureau of Meteorology is predicting a 70 per cent chance of an El Niño in southern Australia, we could expect to have a drier winter followed by a drier and hotter spring. 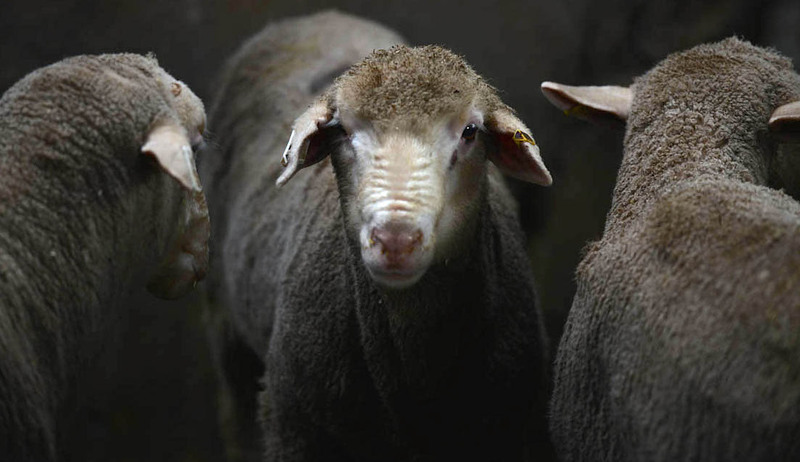 With that outlook, and considering our country hasn’t recovered completely from the fire, we made the decision in May to sell off about 10 per cent of our mated Merino ewes – 600 ewes, right at the point of lamb – which will allow us to hold our stock throughout the year and be in a better position for the ensuing years. We’ve scanned all the ewes and we know we will end up with a good lambing percentage. We’ll be better off having some extra feed to keep those lambs going, rather than having to do a forced sale of some pretty poor lambs. It has been a really hard decision for us to make: there are some really good ewes that have a lot of breeding potential for us. It’s a conservative position to take but we’ve sold them at a reasonable price and, with the rain we’ve already had, we have some confidence that the pastures will recover. There’s still a 30 per cent chance of an El Niño not happening, which would be a better result. It’s raining out here now and we’ve had a fantastic break [to the season]. And if this rain continues, that will be really good because we will able to finish the stock really well. I think we will sleep well, especially if the season turns out dry. But, if it doesn’t, it will give our fire country a better opportunity to recover so we are ready to hit the ground running next year. We will also be able to put a bit of extra feed and effort into our lambs. So if the winter is really dry, we will sell off 1000 old ewes as meat sheep in August when we wean all our lambs. Normally we shear them in September, but this year they will have quite short wool. Because of the fire, our ewes were all away, agisted out on stubbles. We were really fortunate that people were happy to take our sheep, and now they are all coming back. For biosecurity reasons we are shearing them now [May 2014], so it won’t be economical to shear them again in September. ‘El Niño’ was one of those terms that was bandied about 10 or 15 years ago, but not really something that we took that much notice of. We’ve always been aware of it, but this year is the first time we have made a decision to proactively sell stock because of the 70 per cent chance of an El Niño. Although if we hadn’t had the fire in January, that might have made a difference to our decision-making. In the short amount of time I’ve been with the MCV Climate Champion program, we have had a workshop in Canberra that was quite useful for me in giving me some knowledge about the tools that are out there and about how confident the Bureau of Meteorology is about their predictions. The information I gained is that the Bureau can be very confident in their prediction of a strong La Niña or a strong El Niño event, but less so when it is in the middle. Understanding that their tools and modelling are getting more and more sophisticated also gives us more confidence in making decisions around it. And if we don’t get an El Niño, I don’t think our decision will be a bad decision. Out on our hills, the unimproved country is all native grass pastures. A lot of that is perennial. We run mobs of about 1000 ewes and rotational graze across the whole property. We intensively graze a paddock, then move the ewes to the next paddock. They don’t come back to that paddock for 6 weeks, and this allows the perennials to bounce back. We intensively rotational graze our native grass pastures during the spring, and then give it a rest over the whole of summer in the hope that we pick up some summer rains. Then, over the autumn, we can put the ewes out there for lambing, with a feed bank in front of them going into the autumn-winter period. Over the last 5 or 6 years, the number of 40 °C days, and the intensity of the heat waves we are having, are definitely increasing. Before the bushfire in January 2014, we’d had a full week of 40 °C days. We’d had a thunderstorm in the middle of that week which triggered a couple of bushfires locally. On 21 January, an extreme north-westerly wind took the fire from Eden Valley, went through the hills to the east and in the evening we got a really extreme southerly wind change. You could hear the wind change – it was incredible. The front, which was 1.5 kilometres wide, ended up being 12 or 15 kilometres wide and it came back toward our place. Thankfully, it didn’t get the homestead and no lives were lost. But it did take out 70 per cent of the grass on our property. We lost only about 100 sheep and 50 kilometres of fencing. It was just a bad set of weather circumstances, but we have to plan that this might happen more often. Hopefully it doesn’t. Our property has a reasonable amount of shade trees and the livestock have good water facilities. We tended to retreat to the homestead on a 38 °C day; now we go out and do some work on a 38 °C day. And on those 40 °C days, we work early in the morning if we have to and then retreat to the home to do book work or some planning. We ride motorbikes on our hills, but every time you go out you risk starting a fire. My father was always saying, ‘If you are not out there, a fire’s not going to happen’. Our pastures used to be mainly sub-clover, with a bit of phalaris and a bit of cocksfoot, year in, year out. Now, we think about how we can have some diversity in our pastures. Everyone talks about biodiversity in our native bushlands and that’s how our systems have evolved, so it makes us think that maybe we need to have some diversity in our pasture species across the farm. It means that if we are going to get different sorts of weather events, such as get more summer rainfall, we can actually catch that amount of rainfall whenever it falls. So that’s part of our adaption. Lucerne is a crop we are revisiting, considering we have now got summer rains, and lucerne will respond on half as much summer rain. We planted a paddock last year, just to the north of the house, which has a two-fold purpose. It gives us some grazing options, but it also is a firebreak. We used to crop that paddock but having a green perennial pasture on that northern boundary will protect the homestead. That’s part of our thinking, but it is also about food production for the sheep. Historically we had just Merino sheep for wool, but for over 10 years now we have also had a British-breed mating program. We mate Border Leicesters over our Merinos for first-cross ewe lambs and wether lambs. The Border Leicester will produce sheep with good frames, good milking capacity and good mothering capacity. 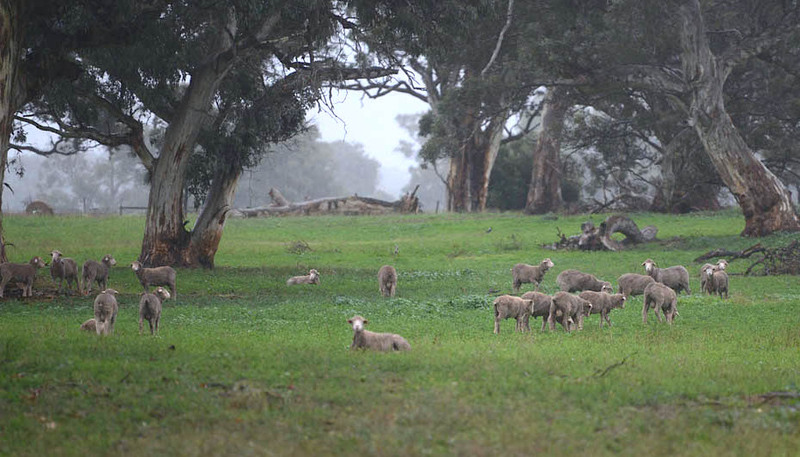 The first-crosses go to three prime-lamb producers down in the south-east, just out of Mount Gambier. They used to breed their own first-cross lambs, which meant they had to have Merinos and Border Leicesters. Now, they only have to put a terminal sire over our first-cross ewes to produce a second-cross lamb with better growth characteristics. We didn’t start up with the thinking that this is an enterprise that will help manage our climate and manage our grass. But it does, because when we have a dry season we can ring up these producers and say we can’t finish these lambs as well as we would like. And they are quite happy to buy them 6-8 weeks early because they know they need the product and they know that it is a good product. Obviously the price isn’t quite as high in those years, but that’s ok. The Border Leicester-cross operation is a really good adjunct for us. It has given us another enterprise. Having an alliance with these three producers means that we have a ready market for our first-cross lambs. It’s been a really great enterprise to have, building on our sheep enterprises, and considering where wool was 15 years ago, where it went through the crash. Introducing that enterprise has helped our cash flow quite markedly. Over the last 5 years, we have been doing some winter grazing on our cereals paddocks. It helps ease the burden on our winter pastures. People used to say if you graze a winter cereal, you’ll impact on the yield production when you come to harvest. But now we understand that if we do it up to a certain time, it will not have any effect on yield. It’s a matter of having a big mob of livestock on it and knocking it down [grazing] quickly, then moving on to let it recover. We have about 250 Angus breeders. We had Hereford, Charolais and a mixture of Charolais Friesian, but we moved into Angus about 10 or 15 years ago. The reason was that they were smaller framed animals – they don’t need as much feed to keep themselves going – but still have calves with good growth rates. We think that that was a good management decision. 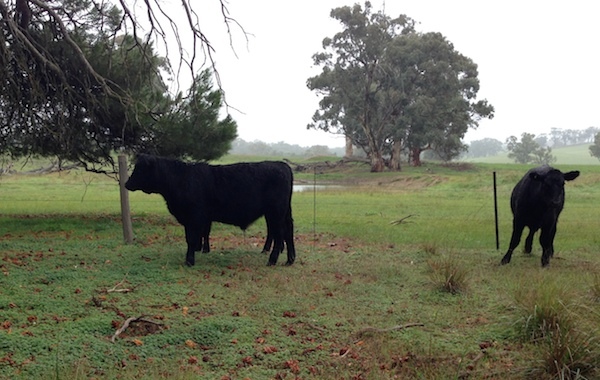 We agist our calves over at Mount Pleasant, which is only 30 kilometres away but has more reliable rainfall. We have an arrangement with a retired farmer there. His average annual rainfall would be at least 635 mm compared to our 535 mm. He has some magnificent pastures and our stock do very well there. That’s where our steer calves end up. We send them there at weaning, in January/February, and he looks after them until August. We sell them off at just under 12 months of age. And then, depending on where the market is, they will either go to a feedlot or a supermarket chain. Most of our calves go to feedlots. The 25th of April, ANZAC Day, is when we expect the autumn break. If it’s a couple of weeks later, that’s ok, but when it gets into June you know it’s a late break. We were calving and spending a lot of energy feeding cattle in that autumn period to keep their production going in a time when we traditionally haven’t had a lot of feed, so we have moved from a autumn calving to a spring calving. The cows are dry [not producing milk for calves] in the autumn, so we can just let them run on the pastures – we don’t have to feed them any hay. We have to manage our cattle a lot better for a spring calving, especially the young cattle. We had them a little bit too fat last year, so we had a lot of calving problems. Our lambing system was the same. We were lambing in March/April, a time when feed reserves were low. And if you got a late break, well, you were feeding, feeding and feeding. We have now moved lambing to the middle of May for the cross-bred lambs and June for our Merinos, when we should have high-quality green feed available. We are finding that we are struggling to produce prime stock as easily as we used to. We have improved our management a lot. 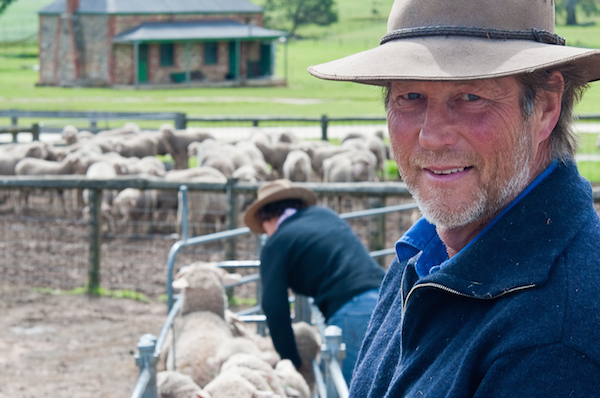 We have upped our production in terms of weaning percentages [lambs weaned per ewe]. Back in the 1970s and 80s, it was 75-80 per cent and now if we don’t get 100 per cent we are disappointed. But we are struggling with the ability to finish those extra stock. We have used a consultant for some years and he is suggesting that we consider reducing our stocking rates by 10 per cent to 15 per cent, which is our feeling as well. I think we are going to have to look at reducing the number of ewes, but still produce the same number of lambs through increased weaning percentages. It will also improve our wool quantity and quality. That’s what MLA’s Lifetime Ewe Management program focused us on. We did that program for 2 years with the North Rhine Sheep Group and it honed our skills in understanding the nutritional needs of the ewes. Having ewes in really good condition is going to give you the best outcome for lamb production, for wool and for meat. We need to make sure that we maximise the potential of each ewe. So even though we might have fewer ewes, if we wean another 20 lambs, the turn-off [number of lambs] will be similar. It’s about having your rams and your ewes in good condition and fertile. The other message that’s becoming evident is that stock in good condition emit less methane. If we can do things that keep us in a viable business but reduce our greenhouse-gas footprint, I think that has to be the way to go. And if we as a property reduce our footprint, over the whole of the world it will make little difference – but you have to lead from somewhere. When my father started, our systems were very cyclical, but very stable. We were doing the ‘same old, same old’ every year. Now it’s really up and down, and we roll with the punches. We are adapting things as we go, every year. Whether we are doing the right thing or not, I’m not sure – but time will tell. Our aim is to reduce our breeding numbers while maintaining our gross margins per hectare. So even if we have to reduce stock numbers, by adapting to the climate, we are still maintaining our gross margins.